powder separating crushers(JAS Series) - Sinchung(Jachen) Technology Co., Ltd.
JAS series-Powder Separating Crusher has two abilities of both crush and screen, especially for limpid, acrilan, white material…and etc. Our JAS series get rid of powder, and improve high quality, reduce defective and saving resource. Size of crushed granules adjustable depends on screen changed. 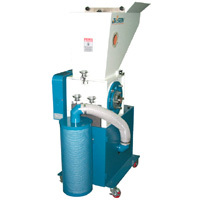 JAS series has dust collector (Bag) to collect powder.